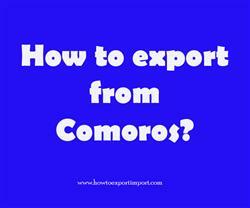 How to export from Comoros? What are the export registration procedures, export customs process, export cargo movement methods in Comoros? Explain the export methodology in Comoros. Information given here explains about step by step procedures that need to be finished with Comoros government authority for exportation from Comoros. All natural persons or legal entities are approved to conduct export and import process in Comoros. For commercial purpose, a registered trade with concerned license (if required) as per the business and have enlisted in the Trade and Company Register of the country is must for exporting and importing of products from and to Comoros. Appropriate authorization from concerned agencies and institution are need to be obtained if required. The Comoros Customs are the authorities that in charge of Border Control, Collection of customs revenues, Provide information about foreign trade, prevent Smuggling, and Facilitation and secure global trade. The exporter should make sure that they made all of the accurate export documents that are required to get the goods delivered through the port, cleared customs, satisfy all compliance and regulations, then loaded on board the pre determined carrier. All export documentation must be completed correctly to avoid any missed shipments, port demurrage charges or fines to the business. The documents may have to be prepared in a special way to comply with the requirements of the import or export country. This post explains about different phases in export process that every exporter needs to go through for completing export from Comoros. How to import to India from Lithuania?